Well, I'm officially back at work now. Thanks so much for the warm welcome!. I'm painting and doing little dolls like crazy. It feels great after almost 15 days of not working, I was aching to hold a paintbrush again! 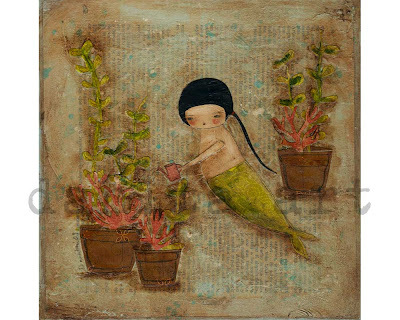 "The sea gardener" 8x8 collage on wood. I saw so many coral reefs in the sea that I thought there should be a someone taking care of them. Available here. "Mary had a little lion". 8x8 on canvas. 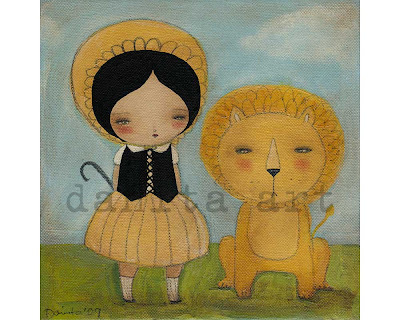 Well, she actually had a little lamb but the lion ate it and now she has a little lion. 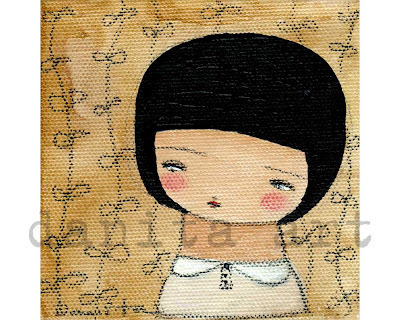 "Susana" 4x4 inches on deep gallery wrap canvas. She and her sister (sold) were the first thing I painted after the break. And last, but not least, the new Frida gang! I'm in love with this cuties. They're all holding something related to Frida Kahlo and they will be in their own boxes just as my other collections. They're not ready yet for sale because I'm not done yet but will be very soon. ooh I love the sea gardener painting, totally adorable! Alaaaaa.....cuanta preciosidad,lo has cogido con ganas después de tus vacaciones....me gustan todas,no sabría cual elegír.UN SALUDO. Love your little mermaid and your Fridas. There's nothing like taking a break to recharge the imagination, but I know how you feel after being away from the studio for a while...I get grouchy!! I love the Fridas! I'll have to have one, I'm sure! Love them all! It feels so good to create again after taking a pause. oo0, I want a Frida! Can't wait. I adore your work!! You are a talented artist. Love the pictures you've taken from your vacation! It's always wonderful to be by the ocean and come home to the art we all love sooo much. Here's to art, love and to wonderful artists!!!!!!!!!!! Hi. My cousin told me about your work and really she is always talking about you. Laura from Ciudad Juarez?? ?and Héctor, her husband? Your work is so beautiful. Like it a lot. She told me that with your experience and work I could find inspiration and work with what I like instead of it being just obligation. And for real, is so inspirational. You've won an Award! Please stop by my blog at http://piggylittleshop.blogspot.com/ to pick it up! Ps : Beautiful work! Love your drawings! Love the Frida dolls, they're so cute! Wow Danita, your new work is fab,and i absolutely love the Frida gang. Thanks for sharing them. wow! i love all your new pieces! just fantastic and so magical! 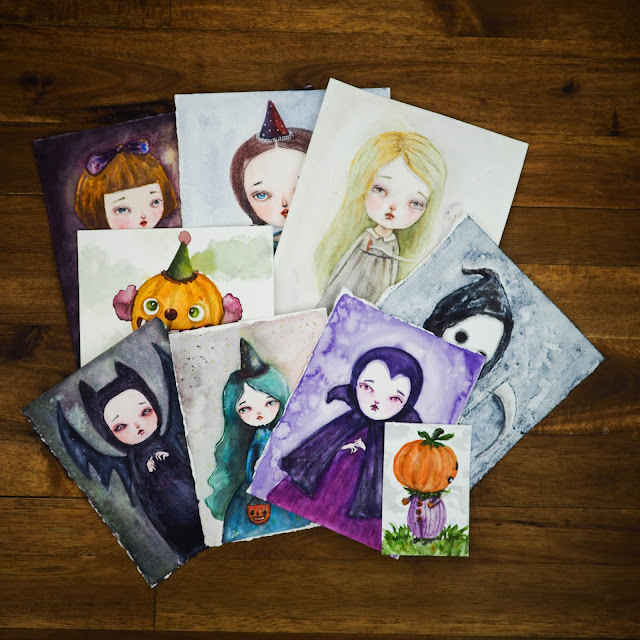 I have just discovered your wonderful art after picking up the current copy of Art Doll Quarterly. I am from El Paso and would love to know if you ever teach any classes locally. it must be good to have that brush in your hand again? They're beutiful, I love the lion. I'm passing the "One Lovely Blog" award on to you. Great to see you back at it!!!! Love what you have been creating, such talent. I LOVE YOUR DANITA DOLLS! soo cute!